Letting our hair down with our girlfriends is something we all look forward to as busy working women, and Enlighten Studio wants to help you start the party off right! Enlighten Studio is located in the heart of Old Town Scottsdale, just steps away from the hottest restaurants and nightclubs. Schedule your pre-beauty party at Enlighten Studio so you and your guests will be paparazzi ready for your night on the town. A girl should always be ready for their close up! 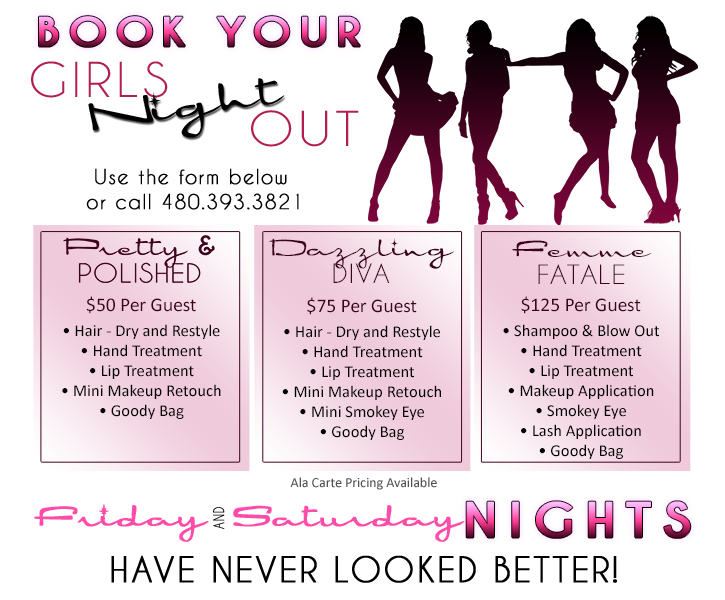 Schedule your in salon Girls Night Out Event on a Friday or Saturday evening, starting at 5pm. We can also include fun appetizers and drinks for each of your guests. You can also hold an event at a location of your choosing, with price upon request. Or a video of your pre beauty party (video emailed to hostess after event). To book your in salon or on site event, email hello@enlightenstudio.com with your preferred date and estimated number of guests. Please give a 2 week notice in advance of your event. We want to make your event an occasion to remember!